Offering a masterclass in prints since 1947, the Emilio Pucci range at Harrods.com brand is the ultimate expression of playful luxury and statement style. With a ready-to-wear line that celebrates the female form in bursts of swirling print and bold colours, plus lush silk scarves bearing the brand’s instantly-recognisable designs, a piece by Pucci is the very definition of Italian craftsmanship and flair for life. Designed to create an eternally elegant silhouette, this emerald green Long Sleeve Wrap Gown by Emilio Pucci is crafted from a reassuringly weighty jersey that hugs and falls in all the right places. A gentle ruching at the shoulders creates a draped effect across the bodice, which is met by a figure-flattering sash waistband, complete with a decorative broach, before the wrap skirt falls to the floor. With a slit in the skirt allowing you to show off a glitzy pair of sandals, add suitably statement-making accessories to complete the look. A striking design from Emilio Pucci, this emerald green dress is perfect for injecting some colour into your SS14 party-wear collection. This stunning dress features a delicate lace overlay with sheer side detailing and bead embellishment for a glittering finish. An ultra-glamorous alternative to an LBD, pair with classic court shoes and a box clutch for flawless evening elegance. An effortless expression of Emilio Pucci’s unique brand of Italian luxury, the Cady dress is a timeless shift style in weighted pure silk. Splashed with a sophisticated palette of purple and orange with black accents, the brand’s signature Pavimento print provides a show-stopping finish. Pair with heeled sandals and a colour pop bag for effortless appeal. Introduce a pop of colour to your eveningwear collection with this stunning cobalt blue Frill Sleeve Dress by Emilio Pucci. Crafted in a fine, stretch-wool blend, the ultra-flattering dress skims the figure’s natural curves before finishing with a frilled hem to create a supremely feminine silhouette. Add further definition by belting the dress at the waist and add statement-making shoes for a directional look. 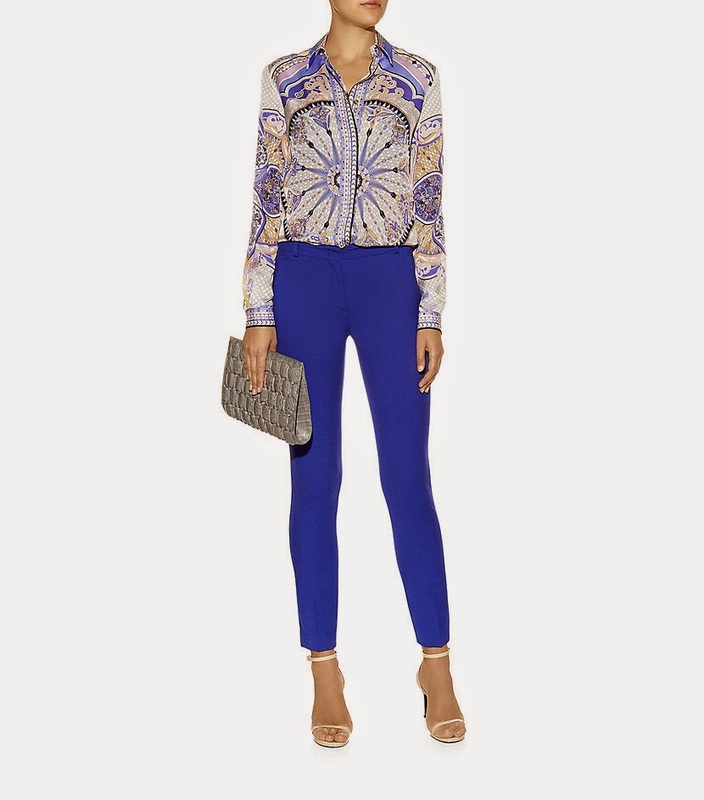 Capture the essence of pure Italian glamour with this silk blouse by Pucci. Bearing the brand’s signature Capri print in a bright colour palette of pink and tangerine, this billowing blouse features a tassel cord trim at the neck and cuffed sleeves. Pair with skinny jeans for a colourful day-to-night look. An effortless expression of Emilio Pucci’s unique brand of Italian luxury, this silk blouse will make a much-loved addition to your wardrobe. Splashed with a sophisticated palette of purple and orange with black accents, the brand’s signature Pavimento print provides a show-stopping finish. Pair it with skinny trousers and sandals for effortless appeal. Intricate crotchet inserts lend rich texture to this neat black cardigan from Emilio Pucci. Knitted in soft jersey, it offers a lightweight fit making it perfect for wear for evenings and to transition your look into spring. Golden crest buttons provide a polished finishing touch. A stunning vision in shades of blue with spearmint green and monochrome accents, Emilio Pucci’s Taitu V-Neck Shift Dress is guaranteed to turn heads. Crafted in fluid jersey with a low V-neck and chic ¾ length sleeves, the simple shift shape is ‘60s-inspired with an about-the-knee hemline. Team with leg-lengthening courts for effortless polish.